I grew up in Flint. I still have relatives and friends in Flint and the surrounding area. I regularly visit Flint. I toured downtown Flint this summer. I happened to be in the studios of WJRT-TV this past October on the day the Flint water scandal became “breaking news” from reporters all over the city. So, to begin, let me illustrate what it's like to live in Flint right now (on a personal level). Do me a favor. Go get a bottle of water and pour it in your bath tub. Not too overflowing, eh? Well, if you have an average size tub that holds 50 gallons, it would take 533 bottles of water (12 oz. Size) to fill the tub so you can take a bath. By the way, you didn't want that water to be hot, did you? Now, I am not going to rehash all the news reports you've been reading. I agree with those who say the most important thing right now is to move forward to remedy the situation as soon as possible. After all, we're talking about the lives and well being of children here. Regardless of your political views, the children of Flint had nothing to do with who their parents are or where they live. They should not be punished for just existing. Right now, we're seeing all sorts of finger pointing and blame deflection strategies. Indeed, Governor Snyder has two PR firms working overtime to shape the conversation (away from blame). My point would be, though, that if determining blame is a concept that is not important any longer, what are we going to do with our criminal justice system? Catching the burglar, identifying the embezzler, jailing the person responsible for banking fraud, stopping that super drunk driver -- no longer a priority? That said, here's what I think this state administration cannot do. If you are a governor who campaigned under the claim that you are one tough nerd whose strength is attention to detail, you cannot invoke the “I did not know the details” argument? Either you are in control of your underlings or you are not. If you are the party of “keep the federal government out of our lives,” you cannot complain that the federal government did not do more to meddle in your life.” Are you for state's rights in all instances or just when it's convenient? If you are of the party that fought tooth-and-nail against federal bailouts of companies and argued that those companies should just go bankrupt, you cannot now go hat-in-hand to the federal government and ask them to bail you out. Wouldn't this be a “conservative of convenience” philosophy? In addition to these items, I keep coming back to the “run things like a business” theory, specifically the governor's line during the last election that “you can trust me because I'm an accountant.” An accountant might have taken a few things into consideration. The bottom line is that the Flint water tragedy makes no sense at any level. There are lessons to be learned, obviously, but we need to know the why as well as the what. In the long run this fiasco is going to impact every taxpayer of Michigan. When the bills come due, we need to know who to thank. 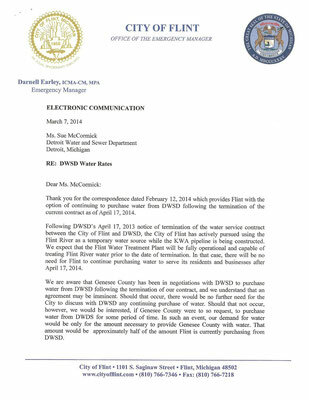 *Note: Below are communications between the DTWS and Flint's EM. They detail the savings Flint would have realized by staying with the DTWS and the rejection of the offer by Flint's EM.